Eat Family: Ebi Sushi - Best in UK? Ebi Sushi - Best in UK? 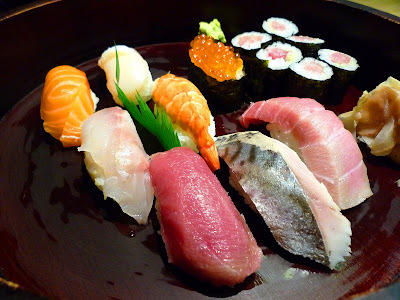 It's big claim I know so let's analyse what makes a great Japanese restaurant in the UK. To me authenticity is the key, somewhere that transports you 6000 miles to a Kyoto backstreet. And that was the impression that I got the first time I stepped through the door of Ebi Sushi. Everything about this place just feels right. From the basic cafe-style decor, warm welcome and most tellingly of all, the mostly Japanese patrons. What's most surprising is that Ebi Sushi is not in London, not even close, it's on a quiet street in Derby! Ok, now I know you think I'm definitely talking nonsense. How can I claim that the best Sushi restaurant in the UK is in Derby of all places? Let's test that authenticity issue again. How does it work in Japan? Well, you hardly ever get huge American-style eateries over there with 200 covers and a crew of macho chefs laying siege to a mountain of ingredients, overseen by some egomaniac head-chef with the money-men baying for blood. Neither do they care much for Michelin stars and all the pandering needed to please those whimsical Frenchmen. No, most Japanese restaurants are small family run businesses that specialise in one type of Japanese cuisine, from the old couple who make just Kyushu style ramen to the sushi master in his underground bar in Ginza. Often the connection between you, the food and the chef is instant. It is prepared and cooked in front of you, there's no hiding place and no excuses when the food is bad. Likewise when the food is good, a simple quiet grunt of satisfaction is enough to convey your compliments to the chef. In the case of Ebi Sushi, the chef and proprietor are one - Mr Ebina. Ebi means prawn in Japanese so maybe it is partly fate that he became a sushi chef. Where else in the country is there a Japanese restaurant that is run and owned by the chef? He has everything invested in this place and it shows in the quality of the food. His dedication is total, like every genuine sushi chef he personally chooses the fish at market everyday. To do this he has to drive to Billingsgate Market in the middle of the night. The top picture shows Ebi's deluxe (上) nigiri sushi set consisting of chu-toro (medium fatty tuna), maguro, mackerel, salmon, ikura (salmon roe), scallop, ebi (of course), hamachi (yellow tail) and tuna maki. I hope the picture does justice to the freshness of the ingredients, this is as good as traditional edo-style sushi will get in this country. It's difficult to describe the brilliance in such simple things, but it is in those things that real difficulty lies. I simply cannot find fault with it, as my Japanese friend says, it is as good as back home. It's comparable to the sushi I've had at the inner market in Tsukiji, Tokyo, which for me is the centre of the sushi universe. For a place in Derby, in the middle of Blighty, a hundred miles from the nearest coast it still seems a little fantastical. It is real, all you have to do is get to 59 Abbey St, Derby DE22 3SJ (01332 265656) and get out again before the Karaoke starts!